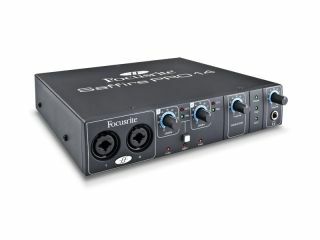 PRESS RELEASE: Joining Focusrite's acclaimed audio interface range is the Saffire Pro 14. It's an eight-input, six-output FireWire audio interface designed for home studio musicians wanting a simple but high-quality I/O device for their Mac or PC. Featuring two award-winning Saffire mic preamps, flexible I/O routing and class-leading 24-bit/96kHz A-D/D-A conversion with JetPLL jitter-elimination technology, it's capable of providing studio-quality recordings - more so than any other competing interface. Based on Focusrite's 25 years of mic pre excellence, the Saffire PRO 14 has the best-sounding preamps in its class. Record multiple sources at the same time, including from inside the computer. Send different mixes to different outputs, or set up stems to mix externally. Professional converters impart pristine audio quality and reliable synchronisation. Can be operated without the need for mains power: ideal when recording on location. Convent ional five-pin connections, for connecting existing MIDI hardware. Metal chassis and body, ensuring durability on the road. Additional software gives you all the tools needed to record and mix a project. With its range of analogue I/O, alongside stereo S/PDIF and MIDI inputs and outputs, the Saffire PRO 14 lets you simultaneously record various sources without having to constantly re-patch your studio. Aside from their mic-preamplification duties, inputs 1+2 accept signals from instruments such as guitars and electric pianos, while line-level inputs can take connections from synths and other external analogue equipment. Digital outboard gear, such as the Focusrite ISA One Digital, can be connected via the S/PDIF ports, and internal Loopback inputs are also available for routing stereo audio between software applications - perfect for capturing online audio. The included Saffire MixControl software, which provides a powerful graphical user interface for the Saffire Pro 14's internal DSP mixer, lets you create custom headphone mixes for artists, route different mixes to the various outputs of the device, and recall cue mix settings at the click of a button. It can also route inputs directly to outputs, providing ultra-low-latency monitoring for performers. The Saffire Pro 14 can be bus-powered by its FireWire connection, or powered by an included AC-DC adaptor. It ships with the Focusrite Plug-in Suite of VST and Audio Units plug-ins, as well as a license for Ableton Live Lite 8 and a host of royalty-free samples.